The Wynyard Golf Club is proud to announce that we are in a partnership with several other golf courses, including Shellbrook, Birch Hills, LeRoy, Watrous, St. Brieux, Craik, Lanigan, & Davidson. Our members will receive a 50% discount on all green fees at these locations, as well as other discounts that each course offers! In turn, Wynyard will be offering the same discount to members of the other Partnership Courses. 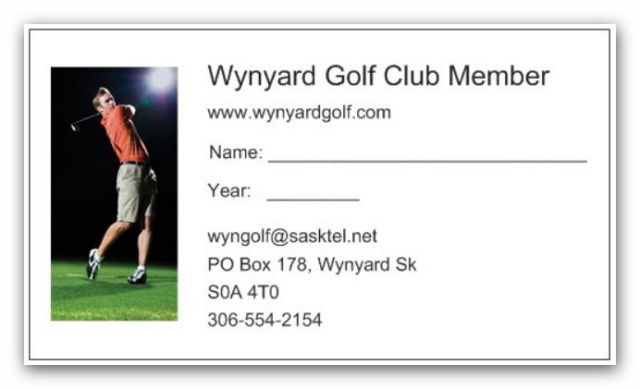 If you're a Wynyard Golf Club member, and you think that you will be able to visit one of the other courses, be sure to drop by the clubhouse, and pick up your Wynyard Golf Club membership card. Your membership card will be required each time you travel to one of the other courses, so be sure to have it with you to take advantage of the discounts! We also have some 'golf passes' to give away, to our Partnership Courses, over the golf season, so you may be able to win a few free rounds along the way! Enjoy the season, as we look forward to seeing you this summer!